One of the toughest jobs on the sea is being a pirate deck hand. Luckily you will be the captain and you have the easiest job, that of commanding your crew. You have to do a good job at it though if you want to keep your hat on. The goal of the game is to get rich of course so start chasing the other smaller ships and shoot your gun at them. Try to knock their sails right off the poles and they will slow down enough for you to catch them before they reach the shore and make a run for it. Also if you knock off their crew members into the water they will surely carry some gold on them and you can increase your richness even more. 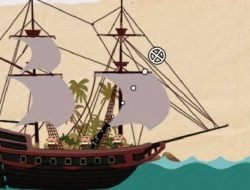 Use the mouse to aim and fire the cannon. Pirates of the Stupid Seas 0.00 between 0 and 10 based on 0 votes.